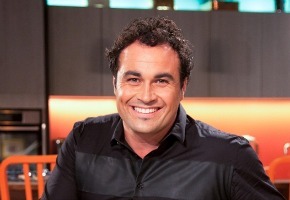 I’m trying to remember if Gabriel Gate ever received accolades from the French Government, or Les Murray from Hungary, but TEN’s Miguel Maestre has been lauded by the Spanish government for waving the Spanish flag in Australia. Maestre was awarded the Cruz de Oficial de la Orden del Mérito Civil (Officer’s Cross – Order of the Civil Merit) by the Spanish Ambassador to Australia His Excellency Mr Enrique de Viguera at a special ceremony in Canberra. The ceremony even took place at the Embassy of Spain in Yarralumla in front of several hundred guests including a large representation of diplomats and members of government. “I’m so overwhelmed, I can hardly speak,” said The Living Room presenter. “I’ve been living here for over 10 years. I came to this country with a suitcase full of dreams, a heart full of passion, and empty pockets. And now I have a family, a career, I’m an Australian, I’m Spanish. And I can’t believe how beautiful this country has been to me”. Just Googled…he was also on Boy’s Weekend a cooking show on LifeStyle FOOD….which thanks to a link back to TV Tonight February 2, 2011 …I found is a Foxtel channel…. Congratulations Miguel….well deserved say I.
Miguel says he can hardly believe how beautiful Oz has been to him. Spain’s not that far behind, they have honoured him with an award for appearing on a program watched by hardly anyone, on a channel watched by almost no one. Does Miguel really qualify as a “celebrity” chef? If you don’t watch The Living Room you’d probably never have heard of him. He’s definitely a bright personality – unfortunately I can barely understand a word he says. He needs subtitles !